A Maine Forest Service forest ranger out hunting last fall came across a strange object he found right in the middle of an old, overgrown logging road on Elephant Mountain. That object has been identified as an ejection seat from the infamous B-52 Stratofortress-C crash that killed seven airmen almost 50 years ago north of Greenville. 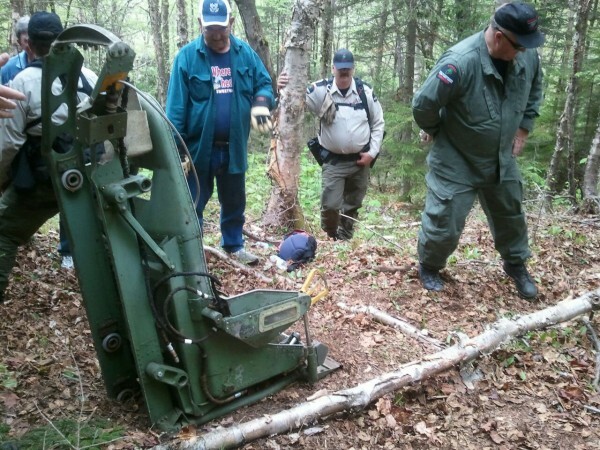 Maine Forest Service District Ranger Bruce Reed, who found the ejection seat, will lead a recovery team on Thursday to retrieve the seat from Elephant Mountain southwest of the crash site and take it to a local snowmobile clubhouse. GROUND PARTY PREPS -- This was one of the first groups of ground searchers who reached the scene of Thursday's crash of a B-52 on Elephant Mountain near Greeenville. 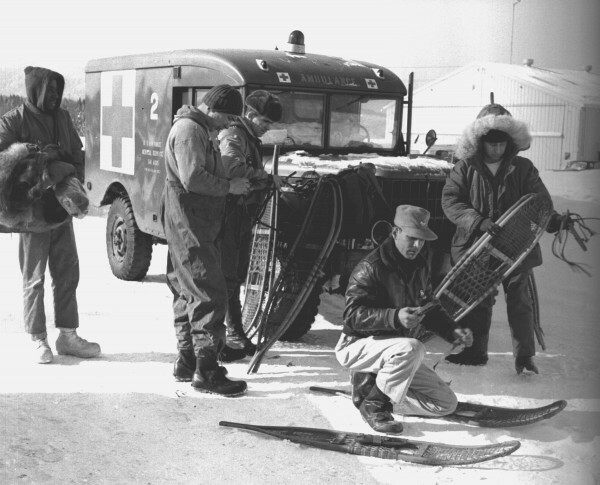 The group tries on snowshoes and tests gear prior to tackling deep snow and stiff climbing to the crash scene. They were based at Greenville until a road could be cleared to within a mile of the area. 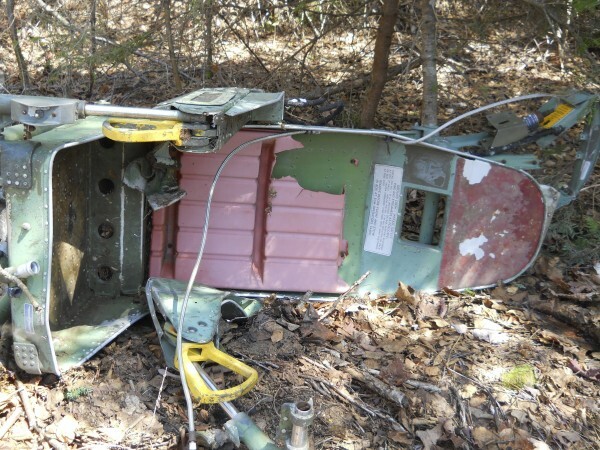 TOWNSHIP 8, RANGE 10, Maine — An ejection seat retrieved from Elephant Mountain in May probably belonged to the pilot of the doomed B-52 bomber that crashed there 49 years ago, the crash’s primary researcher said Sunday. A review of records, interview with the pilot and examination of damage done to the seat leaves Pete Pratt pretty well satisfied that Lt. Col. Dante E. Bulli, the pilot of the B-52C trainer, was the seat’s final occupant. A trace of the serial number on the seat revealed that the seat was made for the pilot or co-pilot’s position. Pratt said he never learned from Boeing Aircraft officials or the U.S. Air Force exactly where the seat was positioned within the craft. Pratt has said he is confident that the seat is part of the bomber that crashed on Jan. 24, 1963. The B-52 had left Westover Air Force Base in Massachusetts as part of an Air Force test of the eight-engine jet’s handling in low-level flight, a key element to Air Force explorations of using the B-52, a high-altitude craft, as a low-level bomber capable of penetrating Soviet and Chinese radar cover. Bulli, co-pilot Maj. Robert Morrison, and Capt. Gerald J. Adler, a navigator seated in the electronic warfare officer’s position, managed to eject in the short time before the B-52C trainer banked right, curved around the mountain and crashed at about 2:50 p.m. Crash wreckage remains strewn through the area. Maine Forest Service Ranger Sgt. Bruce Reed found the ejection seat while hunting last fall. It was outside the approximately 1½-mile no-salvage and no-harvesting zone created by Scott Paper years ago and maintained today by Plum Creek. Pratt and a group of rangers retrieved the seat on May 24. It is possible that the seat remained in the place where Reed found it, but Pratt is doubtful. 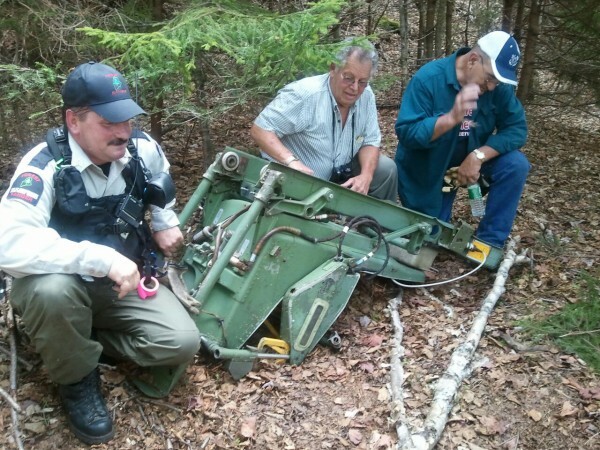 The Moosehead Riders Snowmobile Club’s B-52 coordinator, the man volunteering to continue to build and maintain the memorial the club helped create to the 1963 crash, believes it was probably carried to the point where Reed found it by someone else during its years in the wilderness, Pratt said. Its location doesn’t conform much with the crash and debris fields and Reed found it on an old, abandoned and somewhat overgrown logging road built sometime after the crash, Pratt said. Pratt is much more confident that Bulli was the seat’s last occupant. In Pratt’s recent interview with the crash survivor conducted within a few weeks of the retrieval, Bulli told him that the damage pattern on the seat matches the kind of damage the seat took during the ejection in the final terrifying seconds of the jet’s journey. “When the plane came in after it lost the stabilizer, it made a hard right bank and, as he explained it to me, he blew himself through the hatch,” Pratt explained. Two levers governed the ejection process. One pulled the plane’s steering column away from the seat and blew the hatch over the pilot’s head. The second activated the explosive charge that separated seat from jet, Pratt said. Bulli’s broken bones came because his leg hit the steering column on his way out of the bomber, Pratt said. All of the ejection seats blown from the B-52 have been recovered. Adler’s resides at the Moosehead Riders Snowmobile Club. Morrison’s is at the Maine Air Museum in Bangor and Bulli’s will stay at the Moosehead Historical Society for the near future, Pratt said. Pratt is likely to move out of the area sometime soon and said he didn’t want to speak for the seat’s final display point. Pratt said he is satisfied with his forensic investigation and the seat’s being on display now, about five months prior to the crash’s 50th anniversary. About 7,000 people visit the crash scene memorial annually — a fitting tribute, Pratt said, to the sacrifice of the pilots and crew and to a time when a thin line of aircraft stretched across the sky, on constant patrol, was the front line to the Cold War. “It grabs you when you go up there, let’s put it that way. The interest it has garnered through the years is unbelievable,” he said. Follow BDN writer Nick Sambides Jr. on Twitter at @NickSam2BDN.